FALLING INTO BED… | Jots from a Small Apt. My Reader wanted to know what PANEGYRIC meant. I did, too. From The OXFORD, Third Edition: n. laudatory discourse; eulogy. Now we all know and can slip panegyric snippets of floating-our-boats, long-winded sentences into conversation with friends and colleagues. No doubt one of us will soon be asked to give TED TALKS. No doubt. My Reader says to never-mind about TED because there are bigger fish to fry. I’m going to have query My Reader about that…that bigger fish to fry…since I have only a very small cast-iron fry pan. That bigger fish most likely isn’t going to fit. Who needs a big fish to fry, when the smaller usually tast so much better. Thanks for humouring me with this post. 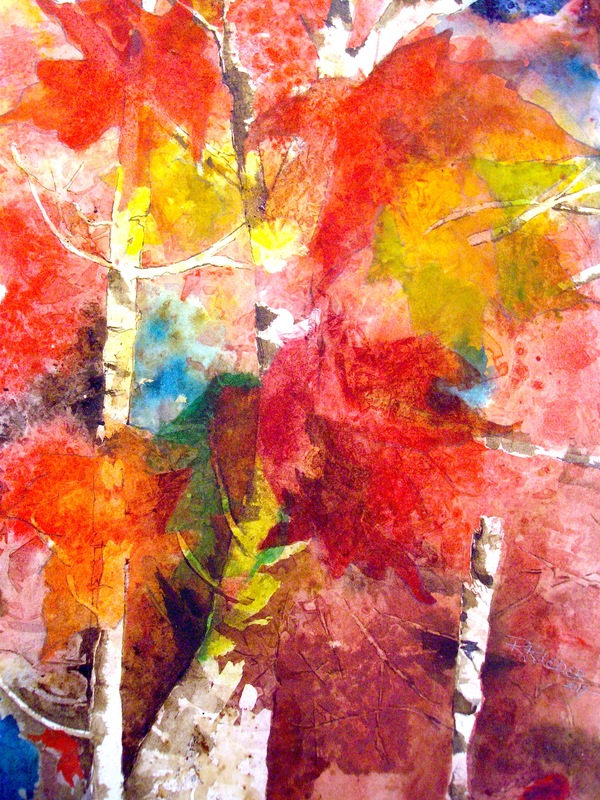 And the watercolour is gorgeous, capturing the atmosphere of autumn and calling for thoughts in the viewer. I done goofed’d. I mispelled my email address in my in my earlier reply. Oh, and here is, by far, my favourite Autumn song of all time https://www.youtube.com/watch?v=ZY2sLSSbdIE by an old folky chuck full of meaning and metaphor. “Lock up the door…you wear your age well….let’s dance that old dance once more….” PERFECT. Thank you, Calvin, for the introduction to Renaissance-Valdy and https://www.youtube.com/watch?v=ZY2sLSSbdIE. The flavour of FALL…the last leaves of autumn…dance on the floor….ageless wearing….you see it. YES. PERFECT. Nice to see you smiling. R.
Look at you throwing colour around like you own it. Autumn! You probably still have colour dripping from the edge your mouth.. Now that you’ve made your bed,you and all of us must now lay in it. For better or for worst. But with you it is always for the better. Thank you for this Little Miss Mystic. Those, these, are colours to be buried in. Artist, they’ll hot wire anything, take for it for a joyride , then return it a little different than it was before. Sometimes even unrecognizable. Your right though, just because a viewer cannot see it doesn’t mean it isn’t there. And just because an artist doesn’t talk, doesn’t mean he or she has nothing to say. I too have yet to, aFa, to toss that little bit of a panegyric illusion into any conversation. Might have to throw a party of some kind, you think? A dance party? A TANGO dance party…..working on it! I overly love your play on words with the title. In this case, my surprise brought forth a smile. Your public praise for the season through your art is very admirable and commendable. Cheers … and have a bountiful day of smiles ahead. That would be one TEDTalk that would trump all others!!!! Goodness, now I am ‘missing’ a good cast-iron skillet.. it’s been years since one was in Z’s kitchen… next trip back to the states, I’ll have to figure out how to manage ‘tucking’ that into my luggage! Thanks for the smile – and for sharing that refreshing painting – the colors are clear without any mud – The header image is great too! It makes me smile as well! You have been so busy busy busy, Charlie! Your dailies. The ART shoppe! Working. How? How? Wonderful posts. Enjoy sooo very much. I bet you can paint one that fits! But then you won’t have the heart to fry it. HA! Never thought of that…..the painting of one. Frying pan. I’ll stop. Nothing makes me happier than seeing an email for a post from Jots in my inbox. Well, nothing besides another email – which shall be answered shortly! Ah…there you are! Reason why I post from time-to-time….just to hear from you and aFa. Responding to email later when I know. Oh…in the meantime….Ooo LA LA…Bon! Tre bon! Better in Spanish…tres bien! Panegyric has never appeared on my blog, so there’s your encouragement. I like it. very colorful. Bigger fish likely won’t fit. Love that Raye. You and Andy inspire me to “try” new things, new techniques. I did the paint on glass printing…not a huge success story but I do have one salvageable piece to “think about”. I’m taking a watercolour class at the moment…seeing the sky has no limits! Thank you. R.
Ah you never know. It’s surprising what you can fit in a small cast iron frying pan. Michael….the fry-up ensues…bigger pan to include everyone. Loved the Quashed Quince…but I think somehow you knew that. R.